Pleomorphic adenoma or mixed tumour is a benign salivary gland tumour, presenting usually in the parotid or submandibular glands. This tumour contains elements of both epithelial and mesenchymal origin. They are the most common tumours (50%) of the major and minor salivary glands. The palate is considered as the most common intraoral site (42.8-68.8%), followed by the upper lip (10.1%) and cheek (5.5%). Other rare sites include the throat (2.5%), retromolar region (0.7%), floor of the mouth and the alveolar mucosa. It mainly affects women in their fourth to sixth decade of life. The patients usually present with a painless and slow-growing mass. 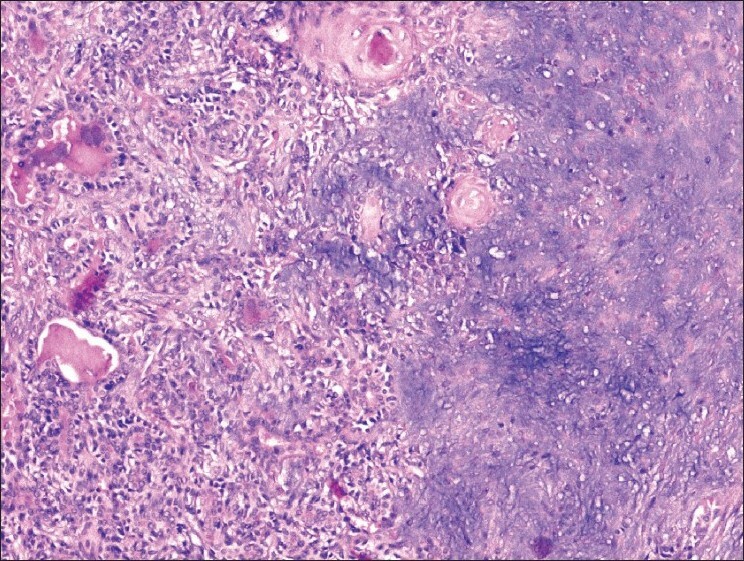 Histologically, it is characterized by a large variety of tissues consisting of epithelial cells arranged in a cord-like cell pattern, together with areas of squamous differentiation or with plasmacytoid appearance myoepithelial cells which are responsible for the production of abundant extracellular matrix with chondroid, collagenous, mucoid and osseous stroma. We present a case of pleomorphic adenoma in the upper lip, which is a rarely reported location. A brief review of the relevant literature is also presented. A 65-year-old female presented with a painless, slowly progressing swelling over the upper lip for the last 2 years [Figure 1]. There was no preceding history of trauma and her past medical history was unremarkable. The general health of the patient was preserved. On examination, the mass was circumscribed, sessile and firm in consistency measuring 2 × 1.5 cm in diameter. The overlying mucosa was smooth with a pinkish purple colour. The skin over the tumour was not fixed. There was no pain or bleeding on palpation. There was no regional lymphadenopathy and her general physical and systemic examinations were normal. 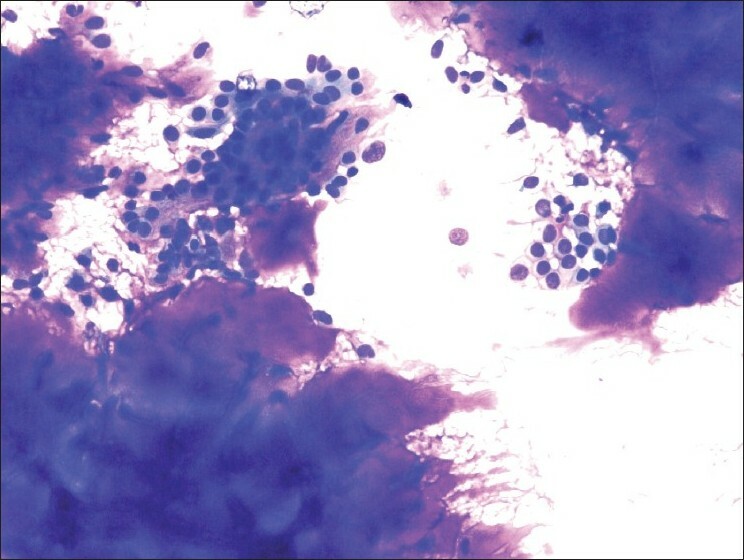 Fine needle aspiration cytology (FNAC) revealed a biphasic pattern comprising epithelial component and fibromyxoid stroma, suggesting a diagnosis of pleomorphic adenoma. The tumour was completely removed with a lip splitting incision. During the surgical procedure, the lesion was excised without difficulty with a clinically normal margin because the mass was fully encapsulated without any subcutaneous or muscle attachments. Sutures were given with good approximation and cosmetic results. A subsequent follow-up after 1 year showed no signs of recurrence. Grossly, a grey-white tissue piece of firm consistency was received, measuring 3.5 × 2 × 1 cm. The cut surface of the lesion was solid and grey-white to tan in colour with occasional cystic areas. On histology, a well-circumscribed growth was seen comprising epithelial and stromal components. The epithelial component formed glandular structures lined by round-to-oval cells having small nuclei, pink cytoplasm and a myoepithelial basal cell layer while the stroma had a fibromyxoid appearance [Figure 2] and [Figure 3]. There was no evidence of mitosis and necrosis. The cytokeratin (CK; DAKO) immunohistochemical marker showed positive staining by the epithelial cells. S-100 (DAKO) and smooth muscle actin (SMA; DAKO) immunohistochemical markers revealed myoepithelial cell positivity. A diagnosis of pleomorphic adenoma was made with these findings. The differential diagnosis of intraoral solid and asymptomatic nodules includes minor salivary gland tumours and benign and malignant mesenchymal tumours such as neurofibroma, lipoma and rhabdomyosarcoma. The minor salivary gland tumours, myoepithelioma and basal cell adenoma, are the primary consideration in the differential diagnoses. Myoepithelial cells are dominant, and ductal structures are very rare in myoepithelioma. Basal cell adenoma is generally palatal in location and has no capsule. The surgical treatment for pleomorphic adenoma is a complete wide surgical excision with a good safety margin. An inadequate resection or rupture of the capsule or tumour spillage during excision can lead to local recurrence. Pleomorphic adenoma of the lip is a rare neoplasm and therefore its diagnosis requires a high index of suspicion. A complete wide surgical excision is the treatment of choice. Recurrence after many years of surgical excision as well as malignant transformation should be a concern and therefore long-term follow-up is necessary. 1. Kaur S, Thami GP, Nagarkar NM. Pleomorphic adenoma of the hard palate. Indian J Dermatol Venereol Leprol 2003;69:74-5. 2. Dalati T, Hussein MR. Juvenile pleomorphic adenoma of the cheek: A case report and review of literature. Diagn Pathol 2009,4:32. 3. 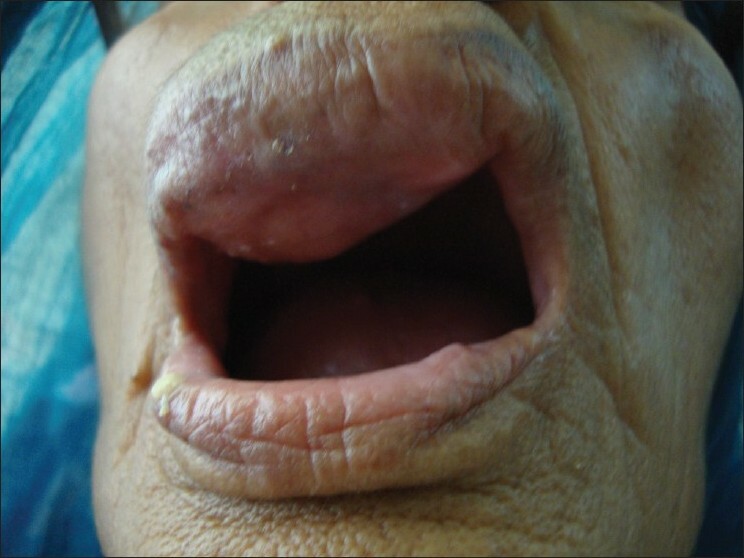 Kucuk U, Tan S. Pleomorphic adenoma of the upper lip. Turk Patoloji Derg 2011;27:73-6. 4. Lotufo MA, Junior CA, deMattos JP, Franca CM. Pleomorphic adenoma of the upper lip in a child. J Oral Sci 2008;50:225-8. 5. Varghese BT, Sebastian P, Abraham EK, Mathews A. Pleomorphic adenoma of minor salivary gland in the parapharyngeal space. World J Surg Oncol 2003;1:2. 6. Shrestha A, Reddy NS, Ganguly SN. Pleomorphic adenoma of the upper lip: A case report. Nepal Med Coll J l 2010;6:51-3. 7. Vernier JL. Mixed tumors of lips. J Oral Surg (Chic) 1946;4:193-202. 8. Eveson JW, Cawson RA. Tumors of the minor (oropharyngeal) salivary glands: A demographic study of 336 cases. J Oral Pathol 1985;14:500-9. 9. Jaber MA. Intraoral minor salivary gland tumors: A review of 75 cases in Libyan population. Int J Oral Maxillofac Surg 2006;35:150-4.